The Other Singularity group is an experienced group of makers and artists that creates interactive works of art examining the line between humans and technology. They deploy experiences that provocatively ask the question of when technology should be deployed. 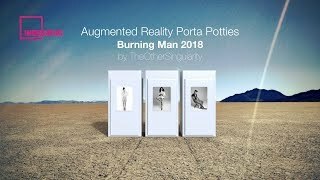 The group teamed up with Jared Ficklin, Chief Creative Technologist of Argodesign, to augment the porta potty reality at Burning Man 2018. Jared designs with technology and has a passion for innovative or unique interaction models, especially those involving interesting inputs and outputs like touch, multi-touch, voice, gesture, sensing and projection. First, the portos will be wrapped in matte white vinyl to take on the austere flatness of the playa. At night, they will be illuminated with a warm white light so that from a distance, they will appear to float on the deep playa. 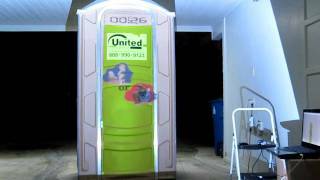 Each unit uses low resolution sonar sensors to measure the distance from door to anything occupying the space. These sensors are hidden and are not capable of producing imagery. 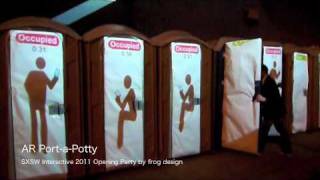 They provide information on if a unit is occupied, whether the occupant is standing or sitting, and how long they have been inside. Because projection on the playa is challenging, the group will convert the projection to scroll signs, which will work during the day and night. Each sign will have its own printed canvas with ten unique styles of imagery for indicating open, sitting and standing. Learn more about the ARP project here. Learn more about argodesign here.